Football season is back in full swing which for most means Sunday, Monday and Thursday night dedication. To me, it means FOOD! 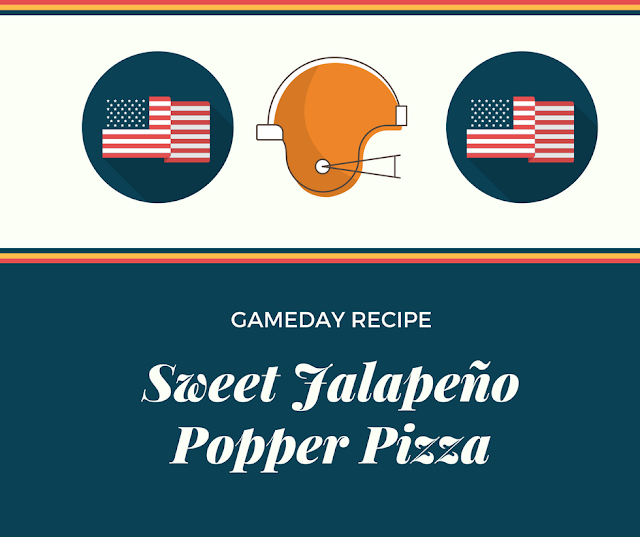 Here is my personal take on a tasty GameDay recipe, Jalapeño Popper Pizza, from no other than Damn Delicious...duh. 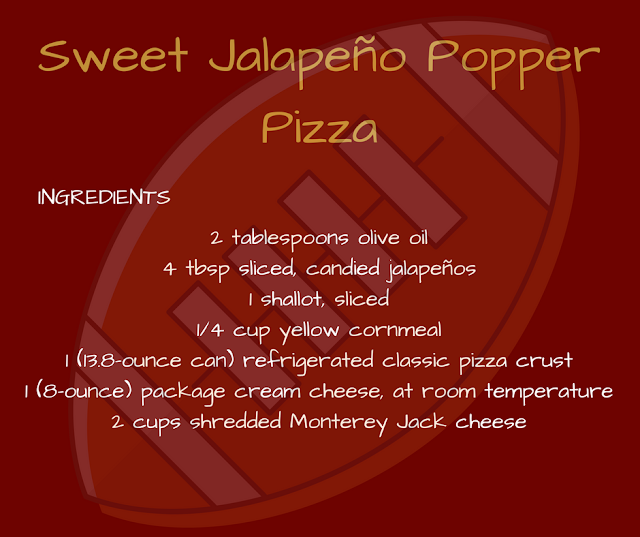 Gooey, spicy and oh so perfect with a cold beer while cheering on your favorite team...Go Niners! First, preheat oven to 450 degrees F and coat a baking sheet/pizza pan with olive oil. I am obsessed with the Trader Joe's Sweet & Spicy Jalapeños, so obvi I needed to use them for this recipe. They pack a ton of sweet heat and I cannot get enough! In a small bowl, combine jalapeños, olive oil and shallot, set aside. Sprinkle the cornmeal where you plan to roll out your dough. Create a 12-inch pizza (or do your best to make it round if you are me) and transfer onto your baking sheet/pizza pan. Spread cream cheese over the top, leaving a 1-inch border. 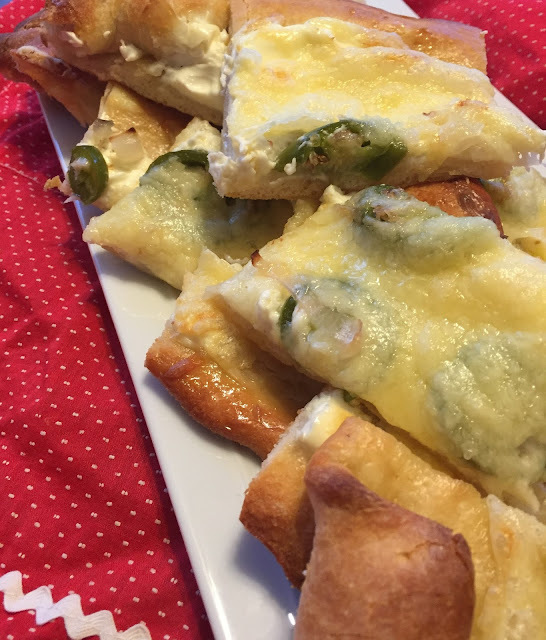 Top with jalapeño mixture and of course, more cheese. 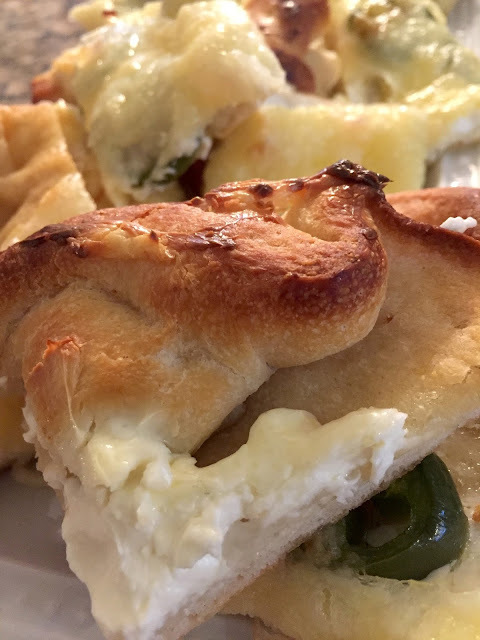 Place in oven and bake for 15-20 minutes or until crust is golden brown and cheese is nice and melted. Enjoy with friends and family wearing your GameDay best! What are some of your favorite GameDay menu picks?